I'm not ashamed to say that this time of year, anything shiny and sparkly catches my eye. Not everything makes its way into my collection, but I love when my everyday basics get a sparkly twist. Invisibobbles's Time To Shine collection caught my attention immediately. One of my favorite hair accessories with a new shiny and festive design? Yes please. 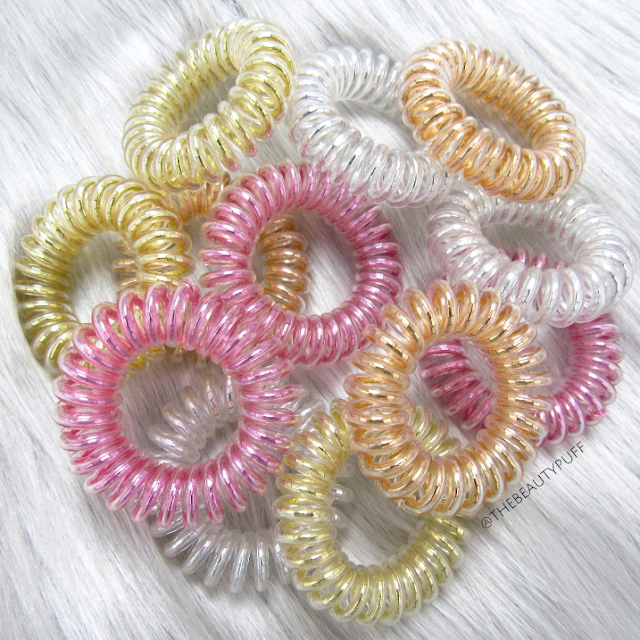 If you aren't familiar with Invisibobble hair rings, they are a flexible, coiled ring that wraps around your hair leaving no kinks or dents. What's even more impressive, is once they stretch out a bit, they can be placed under hot water to shrink to their original size. They come in a multitude of shades, whether you prefer neutrals or vibrant pops of color. You can wear them in your hair or on your wrist as a bracelet. The Time To Shine Holiday Collection is my favorite style by far. It is comprised of four metallic shades: Chrome Sweet Chrome (silver), You're Golden (gold), Bronze Me Pretty (bronze), and Rose Muse (pink). Like other Invisibobble hair rings, each style comes in a pack of three making it easy to gift and put in stockings. I'd rather get these at the bottom of my stocking than candy any day! This collection will accent your holiday outfits beautifully, adding a hint of sparkle for the perfect finishing touch. Invisibobble makes a great gift for Secret Santa, stockings or packaged all together for the ultimate beauty lover. Shop the Time To Shine collection below on Sephora.com!